Our Essentials cable TV package and satellite options are designed to meet the needs of those of you who are perfectly content with a basic set-up that’s ultra-reliable. We love it when we can watch TV without service being interrupted. Mom gets to see the end of her dramas. The kids don’t miss the scary parts of today’s popular sci-fi shows, and dad and his buddies see every point made right up to the final buzzer of those amazing spring basketball tournaments! And there’s no set-top box to worry about for those of you who are cable subscribers! 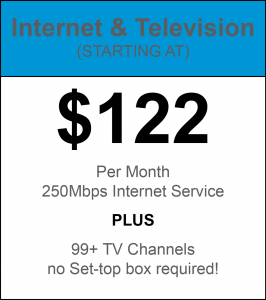 We do require that you bundle our fiber internet with the Essentials TV service, but it is not necessary with all of our satellite choices. With our internet’s speed, you’ll still be able to stream amazingly fast! DayStarr offers more than 99 local and national channels, including favorites like ESPN, Big Ten Network and Fox Sports; Hallmark, Food Network, National Geographic, SyFy, History, TBS, USA, Animal Planet, Discovery and many others. Dozens of the choices on our Essentials line-up are in high-definition. Stop pulling out your hair over your rising cable bill and give us a call. Television services provided by TVC Cable Inc.